Albert Ellis is famous for developing REBT (Rational Emotive Behavioral Therapy), which centered on the idea that depression and anxiety develops out of irrational thinking…or irrational beliefs. Irrational beliefs create fertile ground for the growth of depression and anxiety by distorting reality. Out of this distortion of reality a person is more likely to get “stuck” in a cycle of stagnation, over thinking, and self-defeating behavior preventing a person from reaching goals and moving forward in life. Irrational beliefs are most often used when a person is under stress. Irrational beliefs also profoundly influence relationships. At best irrational beliefs cause dysfunction in relationships. At worst irrational beliefs are a relationship’s demise. Irrational beliefs will beat you and your relationships to a pulp. They are toxic. They are not only hard on your mind and your relationships…they are hard on your physical health, too. Irrational beliefs lock you in a room and hide the key. They send you running on a hamster wheel and leave you exhausted. And, without confrontation…you will go back to them over and over and over again. Some people are so entrenched in these beliefs that they actually will argue that the beliefs are true when at first confronted. In REBT the therapist helps the client recognize irrational beliefs and works with the client to confront and change the habitual nature of resorting to these irrational beliefs. 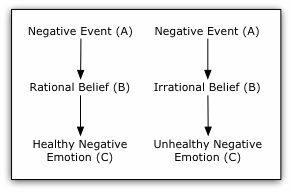 Therapists often use the A-B-C model from REBT to help individuals recognize their irrational beliefs. “A” is the “Activating Event” (I trip over the curb in front of a group of people). “B” is the belief that happens after the event (I am such a klutz and a loser!—version of irrational belief number 2–see below). “C” is the emotional consequence (I feel so down because I believe (irrational belief) that I am a klutz and a loser). The therapist helps an individual recognize what happens at “B”. You can watch where you are going, but most people will trip some time in their life. The fact that bad things will happen can’t be changed…especially not in in therapy. No therapist has a magic wand (as much as they wish they did!). What CAN be changed is how a person responds to the event (B). Rather than “I am such a klutz” a person can change the thought to “Oh, well…no one is perfect…one trip certainly doesn’t make anyone a klutz. Moving on!” The resulting “C”…the emotional response…drastically changes in response to this rational, right belief. No longer is the person down and depressed from believing they are klutz…they have already forgotten that the trip happened and are enjoying time with friends! Christians often appreciate this theory because of how it resonates with 2 Corinthians 10:5: We demolish arguments and every pretension that sets itself up against the knowledge of God, and we take captive every thought to make it obedient to Christ (TRUTH). Resorting to negative, irrational beliefs are a habit and it can be a habit tough to break. Tough, but not impossible. The first step in changing the habit is becoming aware that it is happening in the first place. Now, here’s the thing. We all operate out of irrational beliefs from time to time and to varying degrees. So, let’s get to it. Take a look. Which irrational beliefs do you tend to fall back on? Irrational Belief No. 1: It is a dire necessity for an adult human being to be loved or approved by virtually every significant other person in his community. Irrational Belief No. 2: One should be thoroughly competent, adequate, and achieving in all possible respects if one is to consider oneself worthwhile. Irrational Belief No. 3: Certain people are bad, wicked, or villainous and that they should be severely blamed and punished for their villainy. Irrational Belief No. 4: It is awful and catastrophic when things are not the way one would very much like them to be. Irrational Belief No. 5: Human unhappiness is externally caused and that people have little or no ability to control their sorrows and disturbances. Irrational Belief No. 6: If something is or may be dangerous or fearsome one should be terribly concerned about it and should keep dwelling on the possibility of its occurring. Irrational Belief No. 7: It is easier to avoid than to face certain life difficulties and self-responsibilities. Irrational Belief No. 8: One should be dependent on others and needs someone stronger than oneself on whom to rely. Irrational Belief No. 9: One’s past history is an all-important determiner of one’s present behavior and that because something once strongly affected one’s life, it should indefinitely have a similar effect. Irrational Belief No. 10: One should become quite upset over other people’s problems and disturbances. Irrational Belief No. 11: There is invariably a right, precise, and perfect solution to human problems and that It is catastrophic if this perfect solution is not found. Irrational Belief #12: You can give people (including yourself) a global rating as a human and that their general worth depends upon the goodness of their performances. What do you think? Do any of these surprise you? Sometimes a couple of these irrational thoughts catch a person off guard. For example: “Shouldn’t someone be very upset over other’s people’s problems?” Wellll…hmm. I guess that depends on how you define “very”. Would you add some irrational beliefs or alter these any to fit you and your own struggles more? Want to read and understand more about why these are irrational beliefs? This site here gives much more detailed information. I wish you well in your pursuit of living according to the TRUTH!